Hi , I'm Lorraine and I live in the North East of England with my partner Mally , my two children , Amy and John , not forgetting Jack our treasured family pet . Hope you find the following interesting reading , its just a little insight into our past , present and future plans . When I was growing up we always had a dog in the house , fortunately all good natured as I used to dress the dogs up in dolly's clothes and push them around in a dolls pram , which as I recall none of them minded , as long as they got fed a treat or two. 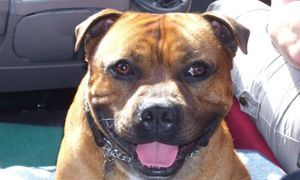 I'd always been drawn to the Staffordshire Bull Terrier , both my own and those of friends . Something about the whole character of the breed appealed to me , that gentle loyal companion , inside that broad , muscular , powerful , exterior , with a swagger and style that oozed attitude . I lost my last Stafford , Bess , several years ago due to illness and vowed I'd not have another . Bess was a rescue dog , she had been brought into the police station where I was on duty , I had never seen such a terrified dog , never mind Stafford in all my life . At the time dog fighting was prevalent in our area and according to the vet who examined Bess , in his opinion , she'd been prepared indoors on a tread mill for such a purpose . Bess was about 2yr old , had been spayed her paws were pink and as soft as a puppies , (not seen any roadwork) her whole body was a mass of rippling muscle from head down to the tip of her tail and she had the biggest , honest brown eyes you'd ever seen , but for some unknown reason she was absolutely terrified of everyone and everything . I knew from that moment I was taking her home , I didn't have the heart to leave her in the kennels overnight . Bess came home with me ran in the house , lay beside the fire and made herself at home , a home where she lived with us until she was 13yrs . It took a long time to socialise Bess and regain her confidence and trust , it was worth it , she was a fabulous pet , irreplaceable , thats why I didnt want another . Last year , 2006 , after being without a dog for several yrs we decided that we'd like another , Amy wanted a Beagle , John wanted an Italian Greyhound and Mally wanted a Dachshund or Pug , there was only one breed coming into the house , yep you guessed , a Stafford . The search was on , I wanted a red Stafford as I'd always thought that they had the nicest expressions ,we looked at several litters but for one reason or another I couldn't find what I was looking for . I eventually got in contact with Carol Ridley (Jagsstaff) who at the time only had an 8 month old dog for sale .We went to see him and that was that , from the moment we saw his beautiful expression and confident attitude we knew he was the one . Jack fit straight into our family , like a hand into a glove and very soon it felt like he'd been with us for ever . Jack is an absolutely fantastic dog , with a fantastic temperament , he will do anything to please and is a total mummies boy , where ever I am Jacks close by , me and my shadow . We'd only had Jack about a month when I decided that I'd like to show him , something that I'd never done before . So off we went to a local general ringcraft class and with the help of Margaret and Ian , and plenty treats , we were off and running . Jack leaves behind a legacy that I am proud of he's there to be seen in the pedigrees of Staffords that I have bred which have gone on to have great success both in the Uk and abroad . Without him none of this would have been possible . Jagsstaff St Elmos Fire , We wouldn't be where we are today if we hadn't found you. Always in our hearts .